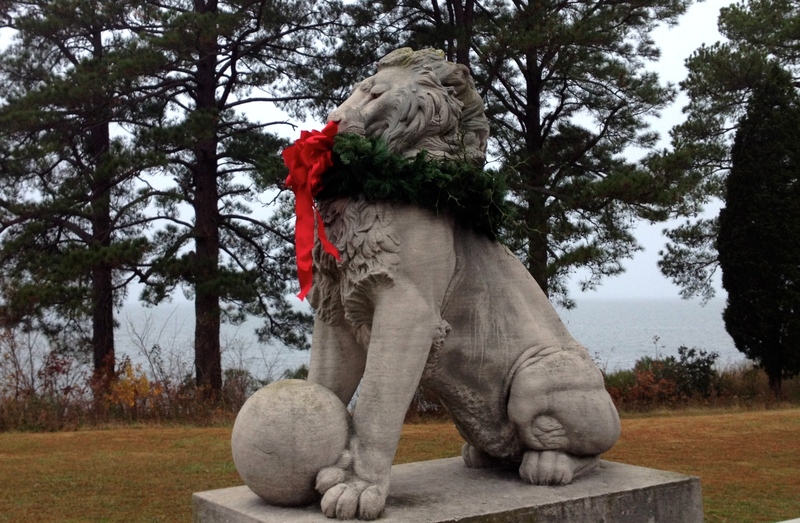 I saw the newly decorated for Christmas lion sculptures today and couldn’t wait to share with you how much the imagery took my breath away! I’m convinced that the one who adorned the four marble creatures anchoring the Lions Bridge knew what he/she was doing! These simple elements, along with the lions’ stately presence announce boldly the victory of the Lion of Judah! Or what if, like Pilate who hung the title, “The King of the Jews” on the cross above Jesus’ head, this decorator unknowingly made a claim for Christ? The natural wreath consists of boughs of an evergreen- a declaration of Jesus’ promise to give everlasting life to each person who puts his/her faith in Him. The thorns interwoven in the wreath speak of the crown that was placed upon Him prior to the crucifixion. (Look closely at the wreath for this detail.) The symbolism of thorns in Scripture signifies the sinful state of man. So, when Jesus wore the thorns, He was showing that He took the sins of all mankind upon Himself; He alone bore the punishment of our sins and died. The single red bow speaks of the simplicity of the route to our freedom from sin and its punishment: Jesus’ blood. Not that it was simple for our Lord to endure the beating and death by crucifixion, but we simply come to God with faith like a child and state our belief in the cleansing power of the blood. No additional nor substitutionary sacrifice would ever be required again! The payment for sin was settled. Period. And with that, I truly wish you a MERRY CHRISTMAS!